Now that it’s officially Fall, it’s time for a little pumpkin! 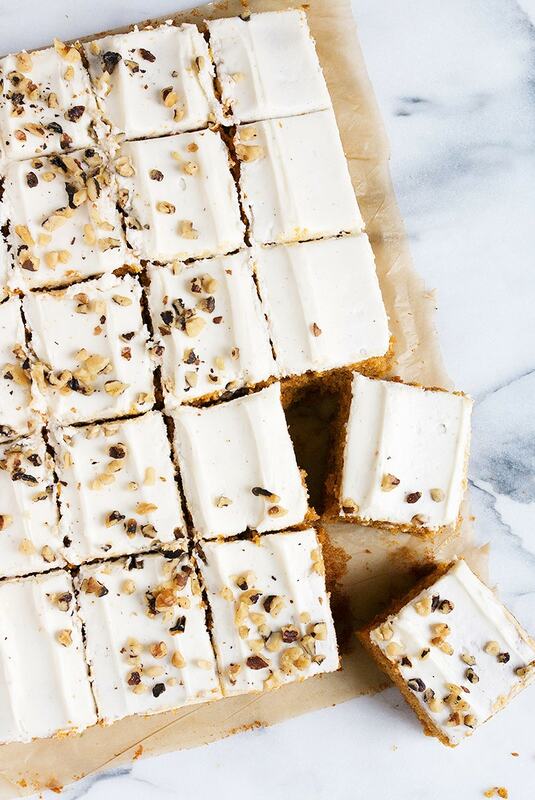 This Pumpkin Sheet Cake with Cream Cheese Frosting is an easy way to enjoy the flavours of the season. 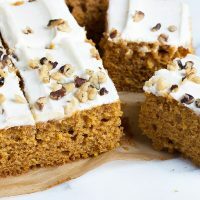 This Pumpkin Sheet Cake is super moist and keeps well for several days. Great for a make-ahead, holiday treat. I love sheet cakes. No layers to fiddle with. Just mix, bake and spread the frosting over-top, all without having to remove the cake from the pan (unless you want to :). Garnish with some nuts and you’re good to go. As this one is baked large and a little thinner, it’s a great snacking cake or a lovely addition to a holiday dessert table. This cake calls for a 15 x 10-inch baking pan (aka jelly roll pan). You’ll want one with sides at least 1 inch high. I happened to have this size cake pan, with 2-inch high sides. If you don’t you could bake in a 9×13. Do note that I haven’t tried this, but my math tells me that a 9 x 13 pan would only take about 3/4 of the batter. So you’d definitely want to hold some of the batter back. A 9×13 cake will be thicker though, for sure, so baking time will be longer. Test in regular intervals until a tester comes out clean in the centre. If you don’t like walnuts, you can replace with pecans or omit nuts completely. I like to scatter the nuts in the pattern down the middle, leaving a few areas uncovered. That way there’s alway a nut-free piece for those that don’t like the nuts. If you make this as a 15×10 sheet cake, there is “just enough” for a thin layer of cream cheese frosting. As such, you’ll want to spread carefully to avoid pulling up crumbs. My strategy is to place 3 dollops in the line down the centre of the cake and to spread each out to the edges. I found the frosting to cake ratio really nice as is, as this cake is thinner than some, but if you really, really love the icing part and just want more, go ahead and double the frosting for a thicker layer. Use the tip of an offset spatula to create a ridged design to your icing. Simply drag it lightly down the cake in lines, leaving a little space in between for the ridges. 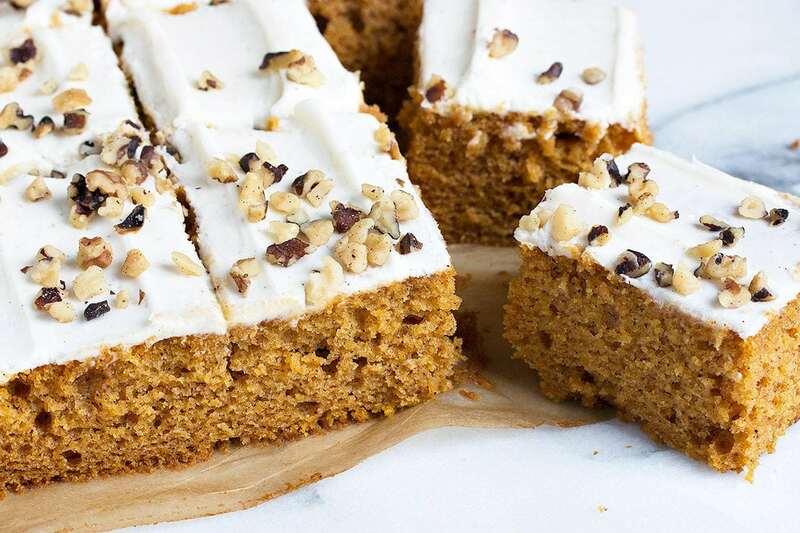 Wondering what to do with the rest of the can of pumpkin after you make this cake? The amount left is the perfect amount to make a 1/2 batch of my Simply Perfect Pumpkin Muffins! 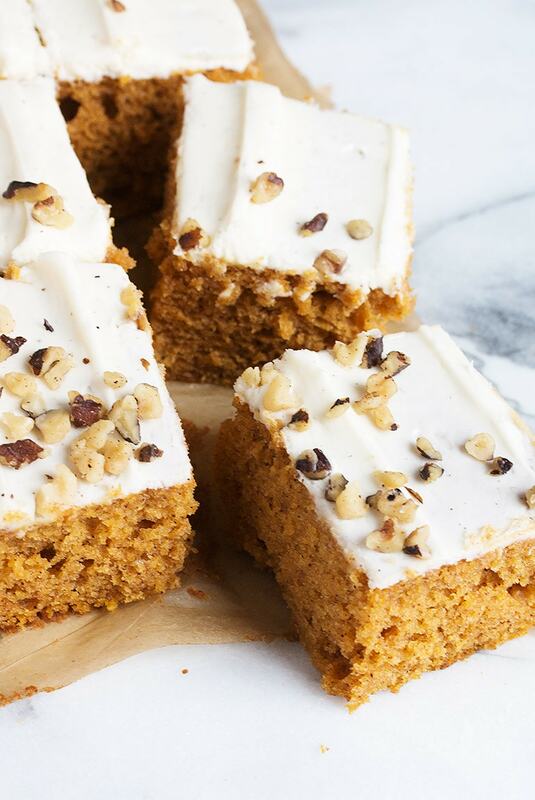 An easy and delicious pumpkin cake, topped with cream cheese frosting and optionally, nuts. Preheat oven to 350F. You will need a 15 x 10-inch baking pan with sides at least 1-inch high. If you want to remove your cake from the pan at all, line the bottom with parchment, leaving an overhang over the sides to use as handles to lift it out. 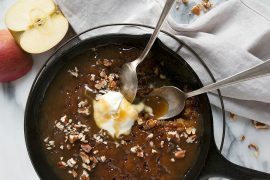 In a large bowl with an electric mixer or the bowl of a stand mixer fitted with a paddle attachment, beat together the eggs, sugar, oil and pumpkin until light and fluffy. In a medium bowl, whisk together well the flour, cinnamon, salt, baking soda and baking powder. Add to the pumpkin mixture and mix until thoroughly combined. Spread batter into an ungreased 15 x 10-inch baking pan with sides at least 1 inch high. Bake in preheated oven for 25-30 minutes, or until a tester inserted in the middle comes out clean. Remove from oven and allow to cool completely in the pan before frosting. Once cooled, prepare the frosting by beating together the cream cheese and butter until light and fluffy. Add the vanilla and mix in. Add the icing sugar a bit at a time, beating until the frosting is smooth. Want to add an 10 x 15-inch baking pan to your kitchen? This one would fit the bill perfectly, at a great price! I brought this to a party recently. It competed on the dessert table with lots of other desserts and it went like lightning! So moist and absolutely delicious. So glad to hear, Kelly! I sent my cake to work with my husband and it disappeared fast, too (and with requests for another one ;) Thanks! This was perfection! Had to cook a little longer than written but came out beautifully. Thanks so much – purchased the recommended jelly roll pan and it fit perfectly. Another keeper of a recipe! So glad to hear, Rachel :) Thanks! 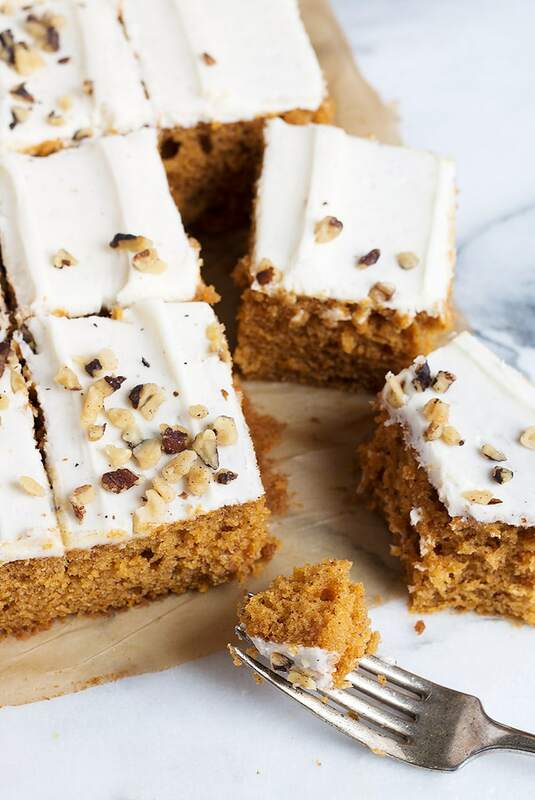 I love a simple sheet cake and this is so perfect for pumpkin season! Can’t wait to try. Yay for pumpkin season Jennifer! This looks delicious! Great for a crowd! Ya know, I’ve never made a sheet cake?? I love the idea of making a big slab of cake and cutting as little or as big of a piece I want. Plus, cream cheese frosting is my fave!! I adore little snack cakes like this, I think I’d eat the whole sheet! 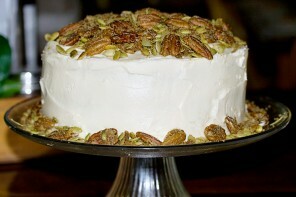 This is the perfect pumpkin cake, love the cream cheese frosting! I’ve been looking for a good pumpkin cake recipe that I don’t have to make in layers – so thank you Jennifer! 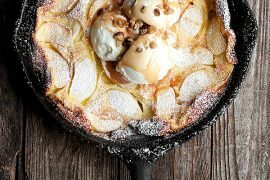 Great for the holidays, easy to serve and the texture looks perfect. Woohoo for pumpkin season! I have a similar recipe that I have been making for years and just made this past weekend as it is a family favorite. This recipe never gets old and is great even without the icing. Freezes well and is a crowd pleaser.